SAN JOSE -– Early in the third period with his team facing an insurmountable deficit, Predators goalie Pekka Rinne took a full windup with his stick and shattered it against the goal post before tossing the remnants to the corner. It was the second-worst demolishing of the night. 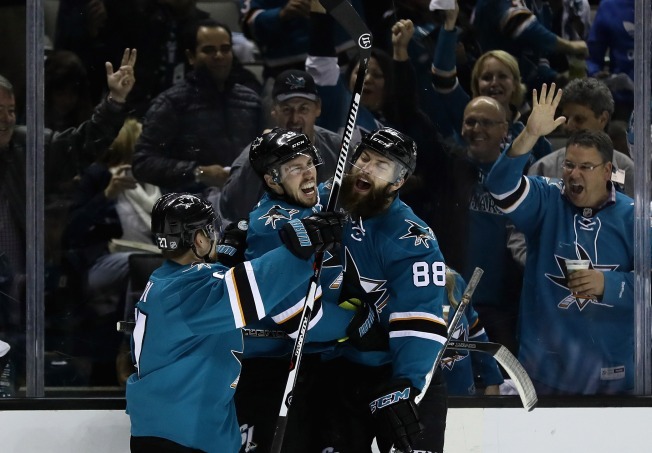 Joe Pavelski, Joel Ward, Logan Couture, Joe Thornton and Patrick Marleau all scored, while Martin Jones made 20 saves in the Sharks’ 5-0 pounding of the Predators on Thursday night at SAP Center in Game 7 of their second round series. San Jose won, four-games-to-three, advancing to the Western Conference Final for the first time since 2011. The Sharks will face the Blues for the right to advance to the Stanley Cup Final, beginning on Sunday in St. Louis. After falling flat in their worst performance of the playoffs in Game 6, the Sharks were all over the Predators from the opening faceoff, and Pavelski’s power play goal capped it off. 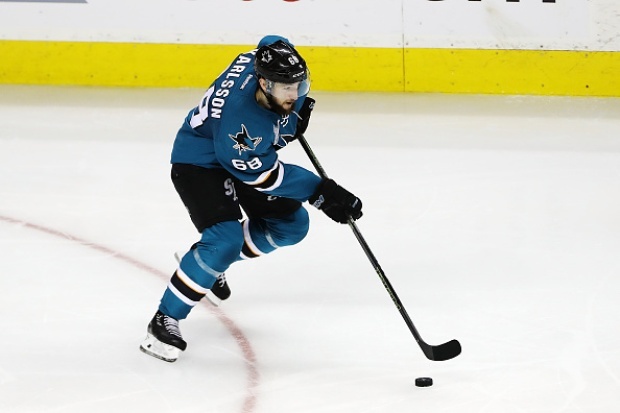 A quick passing play that began with Thornton and continued down low to Marleau was finished off by Pavelski, who potted his ninth of the playoffs at 9:02. San Jose continued to pressure the Preds, and Ward increased the lead to 2-0. After Melker Karlsson chipped the puck ahead off the glass, Ward took advantage of a misplay by Roman Josi, and gathered the puck in ahead of the defenseman. Rinne came out to challenge, but Ward slipped it through the legs of the goalie at 16:51. The Sharks outshot Nashville 17-3 in the first period, including recording the first seven shots on goal. Couture scored a backbreaker early in the second period. Shortly after Nashville killed off some remaining time on a San Jose power play, Shea Weber couldn’t handle a routine pass off the wall, and Couture swooped in before whizzing it past Rinne 36 seconds into the middle frame. The score remained 3-0 until San Jose applied the dagger in the third. Thornton finished off a four-on-one power-play rush by jamming in a Couture rebound 32 seconds into the final period. Later, Marleau hummed a high shot over Rinne at 3:54 on a two-on-one with Couture. Couture, who finished with three points, had 11 points in the series (6g, 5a), setting a new franchise record. The home team won all seven games of the series. San Jose is 5-1 at SAP Center in the playoffs, including five straight wins. Sharks coach Pete DeBoer improved to 2-0 in his career in Game 7’s, while Nashville’s Peter Laviolette saw a five-game Game 7 winning streak snapped (5-2). San Jose improved to 6-4 all-time in Game 7’s, including a 3-1 mark at home. For the 10th time in the past 12 seasons, a California team will partake in the Western Conference Final. The Sharks’ power play capped off a dominant series by going 2-for-3 in Game 7. San Jose finished 8-for-21 against Nashville (38.0 percent), and is 13-for-42 in the playoffs (30.9 percent). Four of Pavelski’s nine playoff goals have come with a man advantage. Nashville didn’t get a power play until 5:26 left in the third period on Justin Braun’s interference minor, and didn’t score. The Preds were just 3-for-20 in the series on the power play (15.0 percent). Jones improved to 8-4 in the playoffs with his first career postseason shutout. Rinne did everything he could to keep Nashville in the game early before the Sharks finally opened the floodgates. He allowed five goals on 26 shots before departing after Marleau’s goal, and is 22-26 in his playoff career. Carter Hutton played the final 16 minutes for the Predators, needing to make just one save. Matt Nieto was scratched from the lineup due to injury after getting hurt in the first period of Game 6. Tommy Wingels drew in after sitting for the previous two games. Weber finished with a minus-three rating, and was on the ice for all five San Jose goals. Colin Wilson, Nashville’s leading playoff scorer, saw a seven-game playoff point streak come to an end. The first two games of the Western Conference Final will be at Scottrade Center on Sunday and Tuesday, before the series shifts to San Jose for Game 3 on Thursday. The series will continue every other day until a winner is decided.